If Margo Price and Dori Freeman have turned heads with stunning album releases in 2016, they may have to shuffle along and make room for Carter Sampson. While the first two have a debut record as their common thread, WILDER SIDE is actually her fourth full release. However as this is the first time Carter’s music has crossed my path, it has all the freshness appeal of a debut record and thus the totally mesmerising effect of bowling you completely over. Carter’s voice is pure Oklahoma red dirt soul and refines its harshness to such an extent that being melted by the tone sends shivers down the spine. The ten songs that comprise this album are packed with memorable lines and are all accompanied by a delicate sound merging subtle twang with that of quintessential steel. This is a record designed for multiple plays and wearing it out will never dilute its endearing qualities. Two key features of Carter Sampson and her new record jumped straight out when digging a little deeper. Firstly, she is yet another superb songwriter currently operating out of Oklahoma who is having their music promoted far and wide. Parker Millsap, John Fulbright and John Moreland are others brought to mind, with the latter singing backing vocals on some of the tracks. Perhaps it is Samantha Crain who could provide the travelling light as she regular leaves her home State for tours of Europe. Of course all classic songwriters from Oklahoma will always follow in the trail of Woody Guthrie. Referring back to the opening sentence in this paragraph, the other significant feature on the album was the production role of Travis Linville, a name immediately springing to mind due to his association with Hayes Carll. Further research on Carter Sampson reveals her as the self-penned ‘Queen of Oklahoma’ and after having a healthy obsession with this record who can disagree. She tends to operate as a solo songwriter with only two songs on the album having a co-write status. Themes range from unsurprisingly the wide spaces of her home environment through a desire to embrace the landscape via travel, which can be extensive even within this segment of the USA. A common feeling from indulging in track after track is to quit what you’re doing and hitch along on this journey fuelled by amazing laid back vibes and highly descriptive memorable lyrics. Once again, full commendation must be reserved for the optimum production handle on the sound giving the breathing space for the songs to flourish. From the unyielding opener and title track ‘Wilder Side’ flushing out the repeated line ‘Sweet Baby James singing on the radio’ to the marvellous mid-way number ‘Medicine River’ enthusing about the ‘Wichita Mountains’, the songs are a continual rich stream of engaging offerings. The classy and sassy ‘Highway Rider’ spars with ‘Everything You Need’, with its road connotations, for my stand out track, but this can fluctuate with numerous others on any of the multiple listens that the record demands. At the start of this review a number of contemporary performers were name checked, but there is another which continually springs to mind upon each listen. Think – an indie Miranda Lambert stripped down to her raw components and the similarities will remain intact for the duration of WILDER SIDE as a relevant release, which from my perspective is going to be quite a while. Continental Song City are putting this record out in Europe and there is certainly a growing market to appreciate the sounds which fully incorporate the seamless strands of folk, country and Americana. Perhaps venturing outside of her usual performing sphere could yield further riches for Carter, even if only from an experience angle. Folks in the UK would drool over such a voice and inspirational songs, meeting an insatiable demand for a little American escapism, while fully understanding that is the real deal life of the performer. Just mentioning a few more tracks before signing off, ‘Take Me Home With You’ is an absolutely gorgeous song which anchors the second half of the album and is closely followed by the dulcet tones of the next up number ‘Wild Bird’. In fact there is not a single track which comes across as a lightweight effort with Carter and her tight knit team deserving every credit. 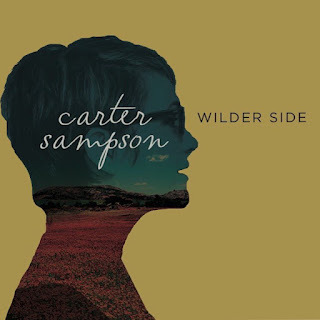 WILDER SIDE has catapulted itself to the upper echelons of this year’s releases and lifted Carter Sampson as an artist to take note of on the international scale. Sometimes the eventual engagement with an artist outweighs the time taken and this is one damn good Oklahoma singer-songwriter who has made a significant impression with a super album.